Scientists recently discovered that Dolphins and Belugas not only blow bubbles for fun – they use them to communicate with each other too. 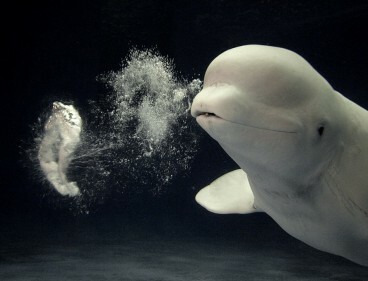 The playful curious Belugas (White One in Russian), much like the beloved Dolphin, are known to approach humans, even in the wild, as if to study the way we speak too. A new study found that dolphins “Talk Like Humans”. They even give each other individual names. In a documentary I watched about a year ago on the subject of dolphin communication, the lead scientist predicted that within five years, we’ll be able to understand their language, possibly enough to communicate with dolphins! – Dolphins do not whistle, but instead “talk” to each other using a process very similar to the way that humans communicate, according to a new study. – All toothed whales probably communicate in a similar way, since they have anatomy comparable to that of dolphins. – The hope is humans will eventually be able to understand and possibly even communicate with dolphins.